Unmanned level crossings on busy routes across the country have turned into death traps as a total of 1101 accidents took place in the last 10 years, killing 353 people. Passengers said unmanned railway crossings on busy routes are carrying high risks of fatal accidents and they have become a matter of great concern for people. 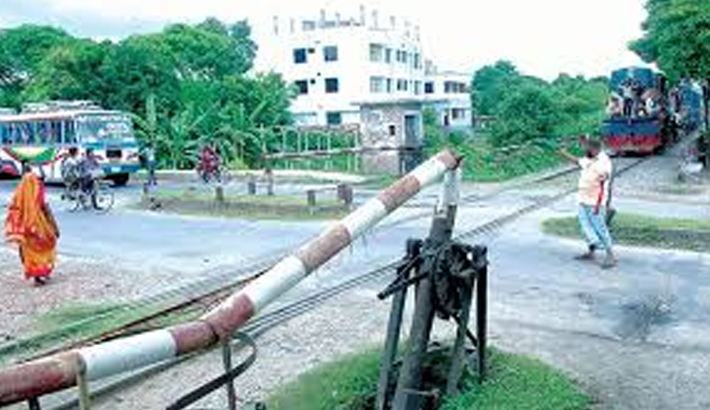 Bangladesh Railways statistics say there are 2,541 railway crossings across the country. Of them, 780 have been approved by the authorities concerned and the remaining 1,761 made illegally. Only 242 approved level crossings are under guard, but 2,299 others are either unmanned or without barriers, it said. Without taking permission from the railway authorities, different government and private organisations have made illegal railroads, sources said. A railway official said there are about 3,000 kilometres railway lines across the country. Without taking any approval from the railway authorities, locals made level crossings at different places. In many cases, local and public representatives are behind the illegal setup of level crossings, he added. “For this reasons, it is not possible to keep all the level crossings under guard,” the official also said. The Railways Act 1890 provides that those who set up roads on railways will have to take the responsibility of their maintenance. When contacted, Kazi Rafiqul Alam, additional director general (infrastructure) of Bangladesh Railway, told the daily sun, “The departments or persons concerned will have to take permission and follow some rules to make new level crossings.” “Whenever any level crossing has been built without permission, we have lodged complaint with the police station concerned,” he added. At least 353 people have been killed and 735 others injured in 1101 accidents at different level crossings in the last 10 years till 2016, according railway sources. A total of 23, out of 58, level crossings in the capital and adjoining areas, have no approval from the railway authorities. Some 54 accidents have occurred in the capital alone in the last three years, sources said. Md Habibur Rahman, additional director general (operations) of Bangladesh Railway, said all the approved level crossings have gatekeepers. He claimed that they arrange temporary gatekeepers for the level crossings where there are no permanent gatekeepers. Railway officials said most of collisions between trains and vehicles and train strike with people occur at illegal level crossings due to failure to decrease speed. Drivers and pedestrians have a tendency not to follow rules while crossing rail lines, which is another reason for the accidents, they added. In recent development, an assistant train driver was killed and 15 passengers were injured as a train hit a stationary truck at a level crossing in Kaliakair upazila of Gazipur on November 24. On January 8, five people, including two children and their mothers, were killed as a train crashed into a car at an unmanned level crossing in the same upazila. On August 1, 2014, at least 11 members of a wedding party were killed and over 50 others injured as a train hit their bus at Barobazar in Kaliganj upazila of Jhenaidah. On July 23, 2015, at least eight people, including three children, were killed as a train rammed into their three-wheeler at an unmanned level crossing in Bakkikhan area of Gazipur. Unmanned level crossings or death traps!